by Shannon Clark in Family Budget | 42 comments | Contains affiliate links. Shannon here! The post you are about to read is a rare guest post here on GrowingSlower. 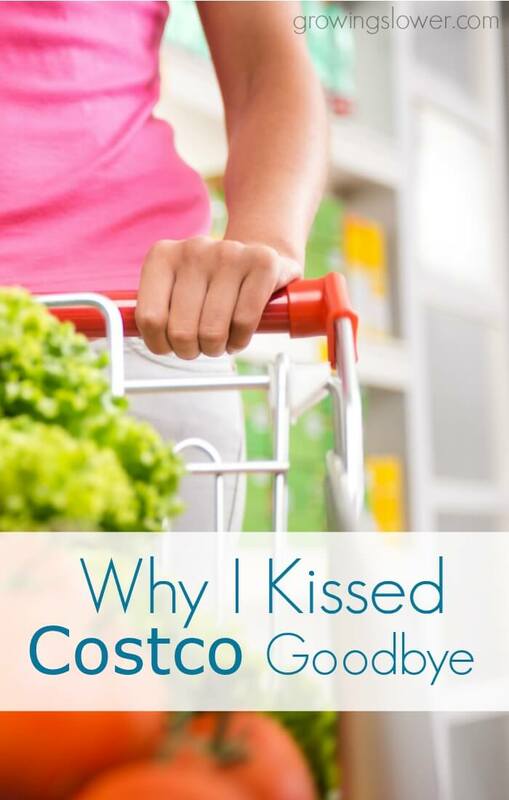 When Heather from My Overflowing Cup approached me with an article entitled “Why I Kissed Costco Goodbye,” I almost choked on my coffee right before deleting her email. You all know how much I love Costco because it saves me a ton on groceries. However, after reading the rest of the post, I knew this would be a great read for those of us with tight budgets that still need to budge. Please welcome Heather as she shares her very honest perspective and a little tough love we all need to hear from time to time. This is not an anti-Costco post. I really, really like Costco. I’ve been a member since it was called Price Club. The thing is, though, times are tough. And things that we used to consider necessities are now viewed as luxuries. When finances are tight, one of the best things we can do is honestly distinguishing between needs and wants. The needs stay, while the wants become negotiable. Costco, for us, has moved from the need to the want category. I used to consider it a need. However, in our current financial state, we can no longer justify shopping there when the closest one is two and a half hours away from us. We used to not mind the gas it took to drive there because we could really stock up and save. These days, however, we can’t justify the cost of the membership or the gas to get there. This was a tough decision for us to make. It was hard to let go, but it was necessary. The thought behind this post is not to complain that I no longer have a Costco membership, but to get us to think about distinguishing between needs and wants. If you are struggling financially, have you taken an honest look at how much of your hard earned dollars are making their way into each category? If you live near a Costco, then this may be a no-brainer for your family. For mine, it doesn’t make sense anymore. Is it something else for you? Maybe it’s time to ask some tough questions. Do we really need a land line when we all have cell phones? Do we need to pay a cable bill each month when we can stream shows and movies online for much less? Are our second and third vehicles a true necessity or expensive items that, while convenient, also carry a financial burden? Please don’t get me wrong – my intention isn’t to pick on your spending habits. I’m simply making the case that things change. Incomes fluctuate. Bills appear monthly. Debt drowns. When you’re needing to make a change in your finances, I’m offering you a different perspective. 1. Honestly Evaluate Needs and Wants. There is nothing wrong with spending money on our wants. The key is to do it responsibly so that we don’t end up with future regrets. 2. Can you come up with an alternative? We’ve given up going to the movies, but we are regular renters of DVDs from our local library. Are you tired of living paycheck to paycheck? Do you desire to get out of debt? Are you saving for something special? Before you spend money you might regret, ask yourself if your purchase is more important than your goal. No one likes giving things up, but when we focus on how much we have, it makes letting go a little easier. Sure, I can’t go out to eat nearly as often as I’d like, but I am thankful to have an abundant supply of delicious, healthy food in my own kitchen. A thankful perspective changes the way we see everything. We can focus on the lack or the abundance. It’s all about perspective and priority. What seems indulgent for one family is basic for the next. I’m not here to point fingers or to make judgments about how people spend their money. I’m simply trying to encourage new thought processes to help us best utilize the money we do have. Heather is living out her dream of living like Laura Ingalls on 20 acres with her husband and two teenage sons. While her family has been hit hard by the economic downturn, she has found ways to thrive on a reduced and unpredictable income. It is her desire to encourage others with the things she has learned as a result. If you’d like to read more about faith, food, and frugality, Heather can be found blogging at My Overflowng Cup. What do you think? Have you had to make sacrifices due to income changes? How have you intentionally sacrificed wants in order to reach your goals? Thanks so much, Shannon, for taking the time to read my post before you hit that delete button! It’s an honor to be sharing on your blog today. Thank you so much for taking the time to write this Heather! I think it’s such a great reminder for all of us as we go into the new year! As I come close to 2015, we are starting to really evaluate our financial plans for the new year. Distinguishing between wants versus needs is so important. I love the points you raised here. We may drop our Costco membership too. We live close but we really don’t use it enough to justify the expense. Plus I find when we show there, we’re not as disciplined with our purchases. I think that distinguishing between needs and wants is one of the most important steps we need to take when we desire to be financially responsible. Thanks so much for reading and for taking the time to share your thoughts with us. I lost my job almost 3 years ago due to downsizing. So we needed to make changes. So we too gave up our Costco membership. Our children are grown and gone and we just don’t need anything that big anymore. Plus it’s just to easy to buy things there we don’t need. Other things we gave up, we no longer go to the movies, we just record movies with our dvr, we rarely eat out, maybe once a month, we got rid of the extras on our land line, and we only eat meat once or twice a week. And when I buy meat I buy it from the “Managers Special” section and save 30 to 50% off original prices.I haven’t figured out how much we save now but it has helped with saving money. I totally agree with you. Considering the products I purchase for my family I really can do better with store coupons combined with grocery store sales. We also venture outside our spending zone-we never leave without dropping close to $150! Obviously that is our lack of self-control while there, however believe I have to let the membership go because of this reason. Great reminder to spend wisely and be grateful. Thanks! Thanks so much for reading, Tobi! The title caught my eye as I scrolled my newsfeed on Facebook! I just got done re-evaluating some monthly expenses that I deem unnecessary for 2015. And, some of them were hard to make the call. But I did. I want to slim down our expenses in 2015. Get a couple of credit cards paid off and when those are goals, unnecessary purchasing is, well, unnecessary. I don’t shop at Costco or Sam’s, because it is just the two of us now but I was in Sam’s last week with my friend and the temptation to impulse buy was overwhelming to me. Today I am making cabbage soup with a 2 pound bag of cole slaw mix I thought was a good buy! What was I thinking? Cole Slaw every day for a month??? LOL. Great, thought-provoking post. I’m so glad you enjoyed the post, Susan. I am cracking up about the 2 pound bag of coleslaw mix! Sounds like you need to make some chow mein and egg rolls this month. It’s also wonderful in a green salad. Hopefully, you’ll find some new, fun, and inventive ways to use it. Thanks so much for reading and sharing your thoughts with us. Our nearest Costco is an hour away, but so is any other form of shopping. We’ve learned to shop only 3-4 times a year as well and find our “wants” in the gifts God has brought right to our house. A tough concept to write about in a material world Heather. Your words are spoken gently in truth and love. Nice to meet you Shannon! Thank you for your kind words and your encouragement, Deborah. I really appreciate it. Blessings to you and yours this Christmas and into the New Year! Well done, Heather! We forget what needs are versus wants. We can simplify so much if we choose to and spend very little on food, etc. We should never live above our means for sure. I remember days when finances were low for our family; I did not think about shopping at Costco; we only had basics- like basic ingredients- flour, eggs, cheese, milk, rolled oats etc. now even these “basics” would be a feast for someone in the world. :)One time my neighbors went to Costco at Christmas time and bought us a box full of ham, crasins, specialty cheese etc. things we would never purchase at that time – it was a FEAST and a huge TREAT and a blessing! So if you do have finances to share, it is a nice thing to do to give a family in need. I never forgot that generosity and we try to carry on this tradition now when we can. Thank you, Heather. Thank you so much, Ilze, for reading and for sharing both that wonderful story and such encouraging words. You are so right – the things we consider basics are things that others don’t even have on a regular basis. It is so wonderful when others bless us abundantly in our time of need, but even more so when we can be a blessing to others. It’s so hard to cut back, but most of what we have are wants. I can definitely relate to this. We are pretty bare bones with our budget and we make ends meet that way. But, we are preparing to enter what I call “The Financial Apocalypse.” My husband is taking a new job, that way he can start his own business. The new job will bring in less than half of what he’s making now. We hope his business (he will work after his other job) will make up for it. We are prepared with our savings, but we are trying to find even more ways, somehow, to cut. God will provide as always. We quit our costco membership years ago and I wouldn’t go back. I highly recommend looking into a local buying CO-OP where you can get a lot of the same deals (or better) because many people are buying wholesale. We recently started doing a lot of our ordering through that and azure. We recently tried to cancel our cable when our promotional rate ended and our bill doubled. I need internet for work. Cable I don’t even want. But for some ridiculous reason it’s cheaper to have both than have just internet. I will never understand. Yes, Amber, I am blessed to have Azure in my area, too. It isn’t as inexpensive as Costco, but my pick up point is only 5 minutes from my house so that makes it very nice. It is interesting how they bundle services, isn’t it? Thanks for sharing your Costco experience with us. I appreciate you reading and commenting. We gave up paying for tv…now only have Canadian Netflix at a minimal cost. No cell phone for me either. We buy in bulk, direct from local farmers (pork, beef, chicken, eggs, grains/legumes, and greens) as much as possible, and then “shop” and eat from our pantry and deep freezer. We preserved the bounty from our garden and fruit trees. Our grocery spending is pretty much limited to milk/cream, cheese, some fresh fruits/vegs, noodles, and a bread every once in a while. We also stopped buying laundry detergent and bar soap and make our own. We don’t pay for tv either, Deb. We buy in bulk and from Azure Standard (a food co-op). We have chickens and garden as much as we can. We make bar soap, but I still need to make my own laundry detergent. It is a fun challenge trying to be as self-sufficient and frugal as possible, isn’t it? Thanks so much for reading and sharing! I can relate perfectly to what you are saying, Erin. We have had several experiences like this in the last few years. We have had to rethink every aspect of our lives as a result. It has been extremely challenging never knowing what income, if any, will be coming it. That being said, it has grown our faith immensely as we have learned that God truly does provide. I will keep your family in my prayers during this transition. Blessings to you and yours. Thanks, Heather for your encouragement. We are totally at peace with our decision and so excited for this time in our lives. We trust God wholeheartedly, but we certainly need prayers. I’ll keep yours in my prayers as well. Thanks so much, Erin! Your prayers mean the world to me. I find that I usually think I need something when everyone else around me has that something. We are really creatures of habit too, so sometimes I feel like I need something just because I’ve always had it. It’s hard to break those patterns of thinking until your forced to. For instance I tend to think that I need electricity every day all day… until they started to shut off our electricity every day twice a day. We find that we actually manage just fine without it and it even gives us a needed break from electronics and internet! Agreed, Caleb. It’s interesting how accustomed we become to things and we don’t realize how much so until we have to learn to do without it. It is our human nature to want the things that others have, but learning to be content with what God has blessed us with is what brings us true joy. Thanks so much for reading and sharing your comments with us, Caleb. Merry Christmas to you and your beautiful family. Hi Heather, these are very helpful tips. Needs and wants are tough decisions to make during tight budgets. the cut down affects every member of the family. thanks for sharing. That’s very true, Ifeoma. Thanks so much for reading. I think making a change between needs and wants is really important. I need to love and care for my family, I want to give them good things, but my love is worth more than any item. I wrote about a similar idea in my post, Why I won’t buy a Tiffany Lamp. Lots more important things in this life than things. That’s an excellent point, Jennifer. Sometimes we take better care of our families by teaching and modeling good stewardship and responsible finances. That is one way of loving and caring for them. Thanks so much for reading and commenting. I’m heading over to check out your blog now. After read your article I understand your feelings completely. I’m a bit old fashioned and I like to cook and bake from scratch. So much of Costco’s food items are ready made and can be pricey. My local grocery stores have great bargains on kitchen staples that are needed. Basically I buy soaps, cat litter and paper goods from Costco. I like to cook and bake from scratch, too, Lilly. I did like their veggies, fruits, oils, spices, and other whole foods. Toilet paper and cat litter are something I will definitely miss, as well. Like I said, if you live close, it’s a no-brainer. I really wanted to get readers to be thinking about needs vs. wants, especially as we head into the New Year. Thanks so much for reading! I’ve never had a costco membership. Are the savings really that great? For me, it’s really worth it. The ability to consistently and predictably save on lots of natural and organic foods saves me both time and money. It does take discipline to walk in there and not splurge though! Brittany, I think that a Costco membership is worth every penny assuming that you live near one. I was a happy member for a long time. It wasn’t until I moved 2 1/2 hours away from the nearest one that it became impractical for me. Shannon is right – they have lots of quality, organic food at the best prices. They also sell a lot of other items that will hurt the budget if you don’t stick to your list. Their return policy is also wonderful as they guarantee that you are 100% satisfied with every product they sell. In 2006 our income decreased by two-thirds. We have gradually climbed back but still only make about 60% of what we used to and have the insane economy and gas prices adding to that. The other day I heard my grown son say the words, “Do we NEED or WANT?” to his wife as they were discussing a purchase. My mommy heart swelled with pride. These are reminders that are good to revisit and often. Oh this makes me sooo happy! I can only pray I will be able to instill these lessons in my children, so they don’t have to learn them the hard way like I did! I can certainly understand your financial situation, April. It sounds very much like ours. Isn’t it wonderful, though, when we can see the good even in the difficult? Thanks so much for sharing that encouraging story with us. Blessings to you and yours. I love this! It can be really hard to figure out what is a “need” and a want. I stopped to think about all of the things that we consider necessities that were non-existent years ago. We never used to have smart phones that we pay outrageous amount of money for, but now we can’t imagine living without them. Thanks for the reminder to put everything into perspective. You bring up an excellent point, Kaylene. Thanks for the reminder that perspective is everything. Blessings to you and yours in the new year! Thanks so much for reading and for taking the time to share your thoughts with us. We recently relocated to a different state for my husbands’ job. I am now a stay home mom of 3 (12,9,1). It has been a challenge trying to budget. Aldi has been the best choice for us at the moment. We can get almost everything that we need there. Milk is $2.99!! But I would like to know, is shopping at Sam’s comparable if I shop in bulk as it would be as shopping at Aldi? I wish you and your family many blessings in 2015 as you adjust to your new situation. I’m sorry that I can’t help you answer this question as I don’t live near Aldi or Sam’s. Hopefully one of the readers will be able to assist you. Thanks so much for reading, Sue! Pinching pennies is never easy as it means having to do without things that we want. That being said, it isn’t comfortable running out of money because we purchased too many wants, either. We have found that we get more joy out of not being burdened with debt than we ever did with having stuff. Blessings to you and yours as you enter this new season of life!